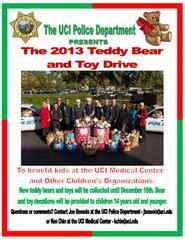 The UC Irvine Police Department and UC Irvine Medical Center Security Department will be accepting donations of new teddy bears, other stuffed animals, and toys during this holiday season. The bears and toys will be donated to help comfort children receiving care at UC Irvine Medical Center and at other Orange County children's organizations (Children's Hospital of Orange County, for example). Donations will be provided to children 14 years old and younger. Bears and toys will be collected through Monday, December 16, at the UC Irvine Police Department lobby, the UC Irvine Medical Center Security Department (Building 33), the Department of Medicine (4th floor, City Tower), and the main lobbies of the UC Irvine Douglas Hospital and Building 200. For additional information, please contact Joe Bessolo at jbessolo@uci.edu or Ken Chin at kchin@uci.edu. Last year's event was a huge success as the UC Irvine community donated hundreds of stuffed animals and toys that were collected and distributed just in time for the holidays. Local children's organizations and hospitals are always in need of additional bears and toys. The need is especially critical for children who have to be away from their homes and families during the holidays. Your donation will be greatly appreciated.